Thursday was a quieter day on board the RRS Discovery and we managed to have some time to relax (and catch up on some much needed sleep). In the morning we all learnt a valuable lesson about what happens when you give a certain SAMS research scientist a filtered coffee before noon - it seems to be roughly equivalent to feeding a gremlin after midnight. Luckily Natalie had calmed down enough by the evening to give Steve, the CPO(s) [Chief Petty Officer (science)] a haircut, with the finishing touches being applied by Eva McQuillan, the Irish Observer on this cruise. Earlier in the blog in the post titled ‘What is happening in the benthos?” we looked at the work of Natalie and SAMS (Scottish Association of Marine Science) in examining carbon cycling and storage in different types of marine sediment. In addition to the measurements outlined in that post, Natalie is also taking separate core samples and measuring them for oxygen consumption and depth in the sediment. One type of measurement involves using a very fine oxygen probe (microelectrode) to find out how deeply oxygen penetrates into the sediment. 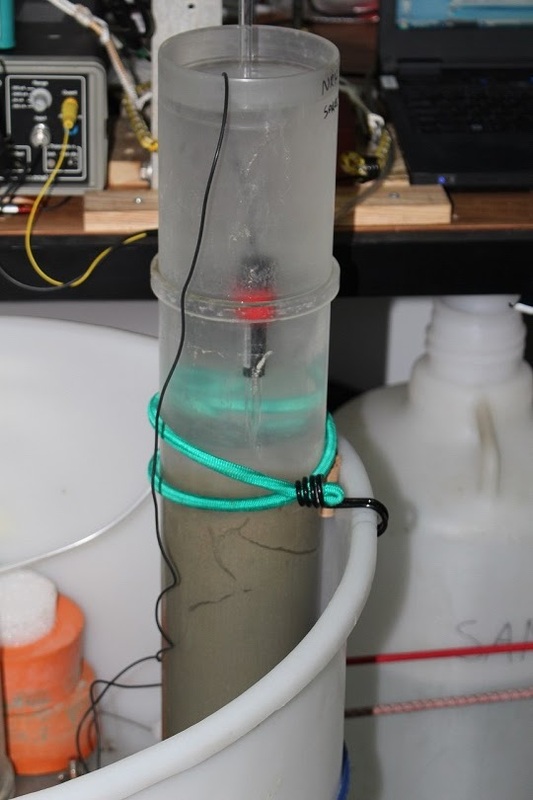 This probe is lowered into a sediment core like the one pictured, and as it goes down the core it measures how the oxygen concentration changes as you descend deeper into the sediment. As you go down deeper into the sediment the oxygen concentration decreases quickly, as the oxygen is being used by bacteria and other organisms living in the sediment quicker than it is being mixed back into the sediment. This decline is not the same for all types of sediment, as the more sandy a sediment is, the deeper oxygen can penetrate into the sediment. This is for a couple of reasons. The first is that muddy sediments have smaller grains which can fit together more tightly meaning the sediment can hold less water between the grains and the oxygen in that water gets used up quicker. The second is because muddy sediments can hold more organic matter giving the aerobic bacteria (bacteria that respire using oxygen) in the sediment more organic matter to consume. In consuming the extra food they will use more oxygen in the sediment. The picture below (Fig. 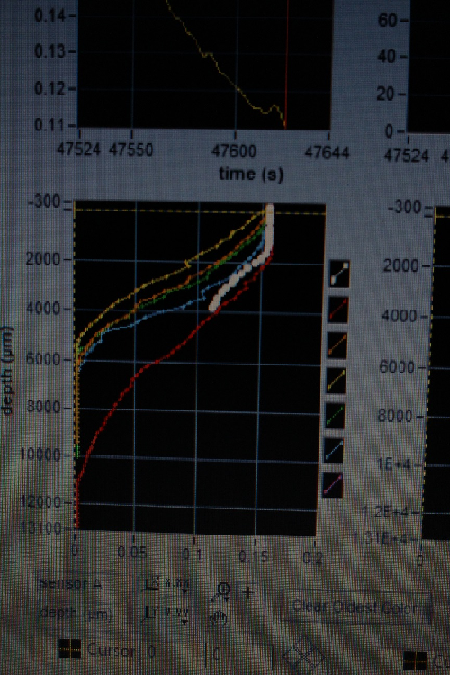 2), shows oxygen profiles from one of the sediment cores collected during this cruise (the sediment type is sandy mud which is mud with a little bit of sand). By just one centimetre (1000 micro metres =1 mm) below the surface of the sediment, all of the oxygen has been used up. If this was an oxygen profile from sandy sediment, the oxygen would penetrate to depths of five centimetres or more. 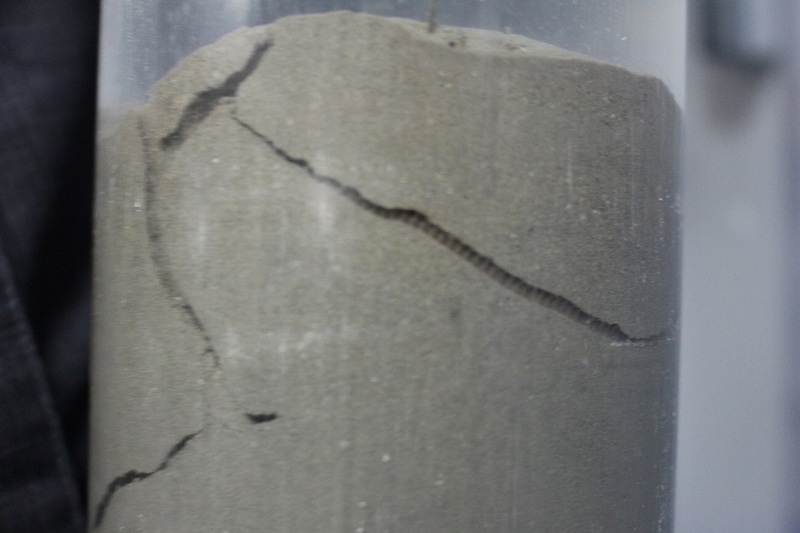 This particular sediment core also beautifully illustrates how some marine animals have adapted strategies to cope with the low oxygen concentrations. The burrow which you can see in Fig. 3 is that of a polychaete worm, and it creates a flow of oxygen from the surface of the sediment down to a depth of several centimetres by moving its body (this is known as bioirrigation). The process of moving sediment (e.g. to create burrows) is known as ‘bioturbation’. This flow of oxygen from the water above the sediment allows the worm to live in the oxygen poor mud and also allows oxygen to penetrate deeper into the mud than it would normally be able to do. This can then affect the chemistry within the sediments and the overlying water, and alter the oxygen penetration depth. Fig. 3: Polychaete worm in its burrow.